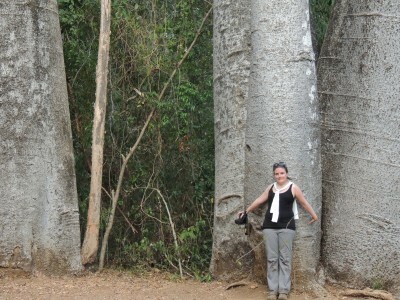 The author Lynne Venart on her first trip to Madagascar in 2012. Photo taken by Christine Venart in Ankarafantsika National Park. As a tourist, it can be intimidating to plan your first trip to Madagascar. It seems so remote and exotic! Plus, it’s large, with a less-than-stellar road system, and the plane tickets are expensive, so you want to do it right the first time. In this blog post, I’ll share a variety of options for traveling to Madagascar for the first time visitor, with some helpful tips and quotes from the experts. Don’t be intimidated, and don’t fret about “doing it right.” There is no wrong way to visit Madagascar. It’s a trip you will never forget or regret! 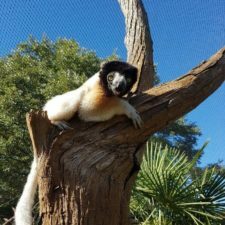 When planning your trip to Madagascar, consider your budget, traveling style, amount of time available, and any key things (or types of lemur!) you want to see. If there’s something you most want to experience, consider planning your trip around that. If you just want to go and see a variety of things, a group tour is a good choice. If you’ve got an extended period of time, you can be less planned and save money by finding guides in-country and going with the flow. Unless you have several months, you’re not going to be able to see the whole country, so prioritize and be honest about what’s important to you and how you like to travel. In Madagascar, they have a saying “Mora mora” which means “slowly, slowly.” Accept that things aren’t all going to go as planned, take a breath, and just enjoy the magnificence of Madagascar! 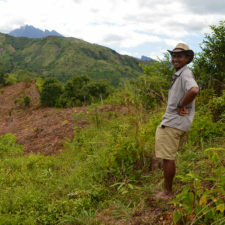 The Duke Lemur Center’s 2013 Madagascar trip with Charlie Welch. 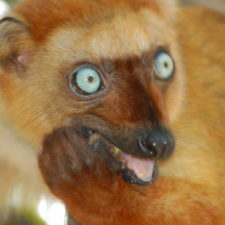 Photo courtesy of the Duke Lemur Center. 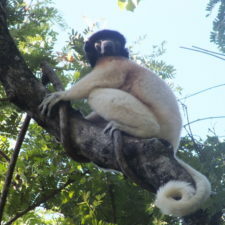 Many first-time visitors go to Madagascar on a group tour with a US- or UK-based travel agency. These tours often take the southern RN7 route from the capital, with a day or two at several parks along the road to Tulear. The RN7 is a good, well-traveled road, and you’ll likely be in a comfortable SUV or tour bus. You’ll see several towns, and experience a variety of landscapes and animals, but you won’t spend very long in any one place. 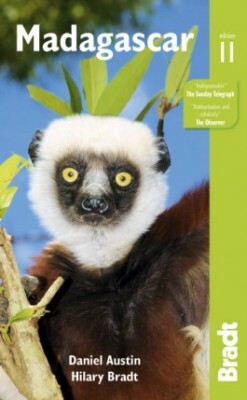 The Duke Lemur Center and some zoos also offer an annual or semi-annual trip to Madagascar, accompanied by experts. These can be more expensive than other group tours, but you get the privilege of traveling with experts like Charlie Welch from the Duke Lemur Center, who will share his in-depth expertise on lemur conservation spanning decades. And, you can feel good that your trip costs are supporting a great organization. Madagascar is still in its infancy of tourism and doesn’t have a very well developed tourism structure. Whilst it is certainly possible to hire a local guide on your own, unlike many European destinations, there isn’t a big, central tourist area in the cities that you visit to find all the local tour guides and tour options. The benefits of using a good international tour operator (make sure they specialise in Madagascar rather than just have a couple of trips) is that they can ensure you get the best out of your time in Madagascar, ensuring days aren’t wasted. Good tour operators have partners within Madagascar and have developed trips to suit their clients – the requirements of a Chinese tourist are very different to a British tourist. If you have a good operator they will also be able to organise more adventurous activities rather than simply visiting national parks. Find a list of reputable Malagasy travel agencies in the Bradt guidebook. There are many Malagasy travel agencies that offer customized tours of Madagascar for you and your travel companions, with English-speaking guides. These can be less expensive than a tour with an international travel agency. Many also offer group tours that go to less-traveled areas of Madagascar, or tours for specialized interests like birding, photography, or river trips. A good Malagasy travel agency can also help customize an itinerary if you want to see a specific lemur or organize your trip based around a few key locations. When building a trip itinerary, be sure you listen to your Malagasy travel agent. They know the country better than you do, and if they say it’s too far between locations for your itinerary to be reasonable, believe them. One of the benefits of traveling with a locally based agency is simply disintermediation: in some cases you will be able to get a better price compared to a UK/US based agency and 100% of your money goes directly into the local economy. A Malagasy owned agency would give you extra insurance that your money stays in the country. On the other hand, there is more homework to do from the travelers’ end: choosing the right local agency is not easy, there will be much more email/phone exchange to do, and by booking direct you will often be on your own to deal with your international flights. Also note that Madagascar local regulations do not protect you if you book a trip through a local guide or a hotel in the case you run into issues. Only professional tour operators will provide you adequate coverage and insurance in case of problems. The beautiful Nature Lodge outside of Mt. Amber National Park. Photo by Lynne Venart. If you know you won’t be happy in rustic accommodations, many of the main destinations have very comfortable lodges. You’ll have no problem finding luxury lodging in Antananarivo, Isalo, Anjajave and many other places, but you will pay for them. Be honest about what you need your comfort level to be when planning your trip. Expect a mixed bag, and accept you’re in Madagascar and things might not be up to Marriott standards! You will be pleasantly surprised at how beautiful and unique the hotels and lodges are, and often the views can’t be beat! No matter how you get to a national park (whether you’re on a tour or not), you’re going to need a guide for all of your hikes in the parks. Not only is this the law, it also supports the local economy, and ensures that the parks—and their endemic flora and fauna—are valued. Additionally, the guides go through extensive training, so they know how and where to spot the wildlife, and can tell you all about it. Most often, packages with travel agencies will include the guide and entrance fees for the national parks. 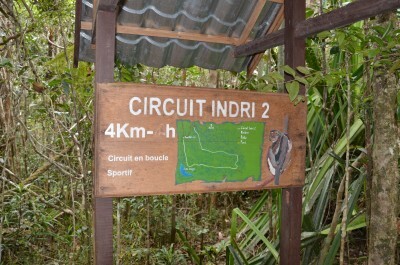 One of the hiking paths in Andasibe National Park, Madagascar. Photo by Lynne Venart. 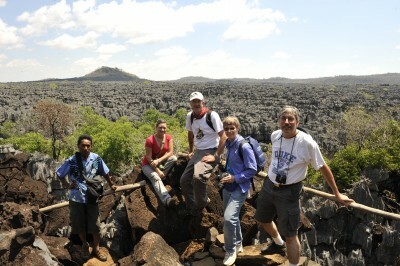 If you go with a large tour group, your package will come with a handful of guided walks. But, you can still book your own at the park if you want a more customized experience or additional hikes during your stay. If you know where you want to go, and have the time to do some research, you can email hotels and lodges directly to book. They can often help you book your transportation to the lodge, and this may save you some money compared to booking with a travel agency. 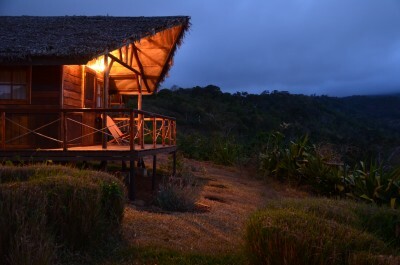 This could be a good option if you know you want to spend an extended period of time at a specific lodge, or if you plan to base yourself in Antananarivo and do shorter side trips. 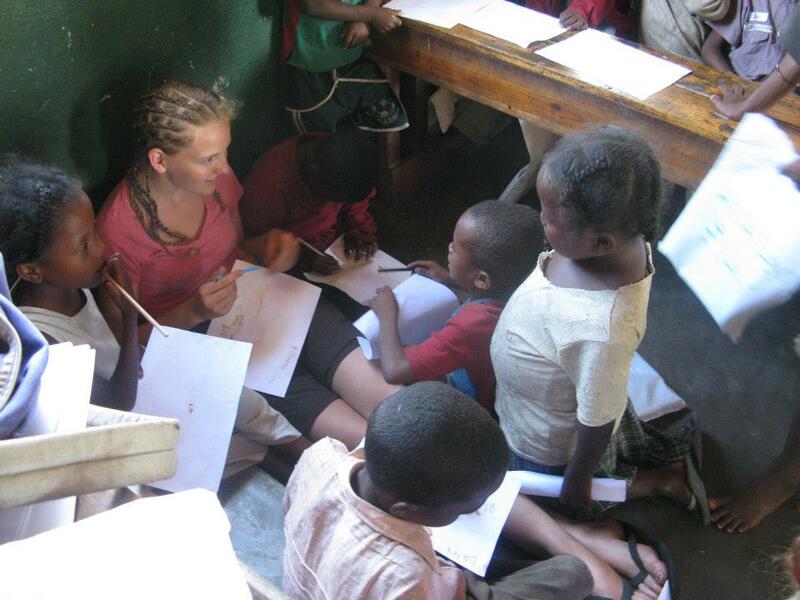 Azafady volunteer drawing in conservation club. If you want to spend a couple weeks (or more) in one location, and learn what it’s like to work in conservation in Madagascar, volunteering is for you. Check out volunteer opportunities with our member organizations to find the best fit! Definitely safety issues is one of the biggest misconceptions. By reading the papers, people think Madagascar is a troubled country, but it’s a perfectly safe place to spend holidays as long as you follow usual travel precautions. Malagasy people are very friendly, welcoming. We just don’t have enough means to counteract the paper selling negative articles. The second misconception would be that people underestimate the size of the country because it’s an island. This island is bigger than California and more than twice as big as the U.K. You need to take the time and play it “mora mora” to fully enjoy what the country has to offer. We asked our experts about some of Madagascar’s most unique experiences. 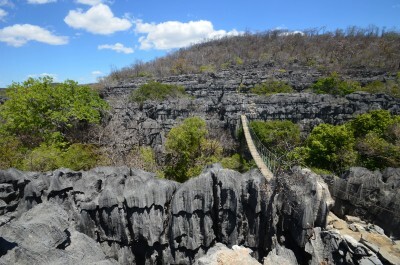 A walking bridge across the tsingy in Ankarana National Park, Madagascar. Photo by Lynne Venart. One of my favourite things to do in Madagascar is river journeys. This really lets you get into the areas unvisited by tourists and get a lovely feel for the country. On many of the river journeys I have done in Madagascar, you might be the only ‘European’ the Malagasy people might see that year. It is a great chance to interact with communities. On top of this, all of our treks and river journeys employ local villagers which obviously has financial benefits for the locals but also helps also gives you a unique insight into ‘normal’ Malagasy life and people. Walking in a pristine rainforest or unique rock formations to observe out-of-this-world wildlife and flora are definitely a must-do. But the unique culture—which is a surprising mix between African and Asian—will definitely pleasantly overwhelm most travelers. Other unique experiences which are accessible are: a visit to a traditional zebu market place, attending a turning of the bones ceremony (a.k.a Famadihana), or simply stopping in a random village to connect with locals who will show you how their lifestyle has not changed in hundreds of years. We are also very proud of our gastronomy which has been influenced by hundred of years of migrations from near and afar. Maybe you would fancy a cooking class? There are so many amazing experiences to be had while traveling in Madagascar. Traveling to this unique island and seeing lemurs in the wild is on every lemur fan’s bucket list. So, why not make it a reality? You won’t regret it! Join the Duke Lemur Center’s 2016 trip to Madagascar!